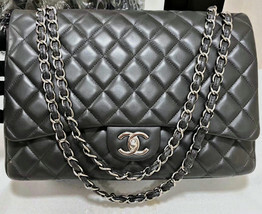 Up for sale is an ULTRA RARE AND ABSOLUTELY STUNNING AUTHNTIC CHANEL HOT PINK QUILTED LAMBSKIN JUMBO DOUBLE FLAP BAG WITH SPARKLING SILVERTONE HARDWARE!!! 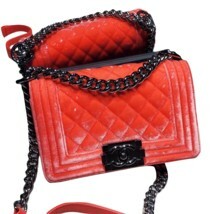 This Chanel Pink Lambskin Jumbo Double Flap Bag is the perfect bag to add a pop of color to your white tee and skinny jeans or dressed up for any special occasions! This classic flap features soft, buttery diamond quilted lambskin leather in bright hot pink and gold tone hardware including leather woven chain shoulder straps and a CC turnlock closure. Open the flap to a small zipper pocket and hidden back pocket, open the second flap with a snap to a spacious interior with two pouch pockets and a front media pocket. 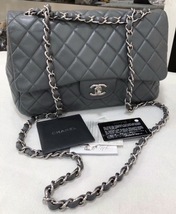 This is a gorgeous classic flap that will withstand fashion trends with a chic style from Chanel Bag is in excellent condition with very minor signs of use. Very slight rubbing of corner edges. Comes with matching authenticity card. GUARANTEED 100% AUTHENTIC. PLEASE PURCHASE WITH CONFIDENCE.